For a sweet end to our Fall Harvest dinner we ate warm cardamom pear crisp with just a spot of cr?me fraiche on top—a wholesome ending to a fantastic night. We served ours in individual ramekins. You can do this at home, or in one dish (as explained below) for a more family style dessert. Preheat oven to 350 degrees. 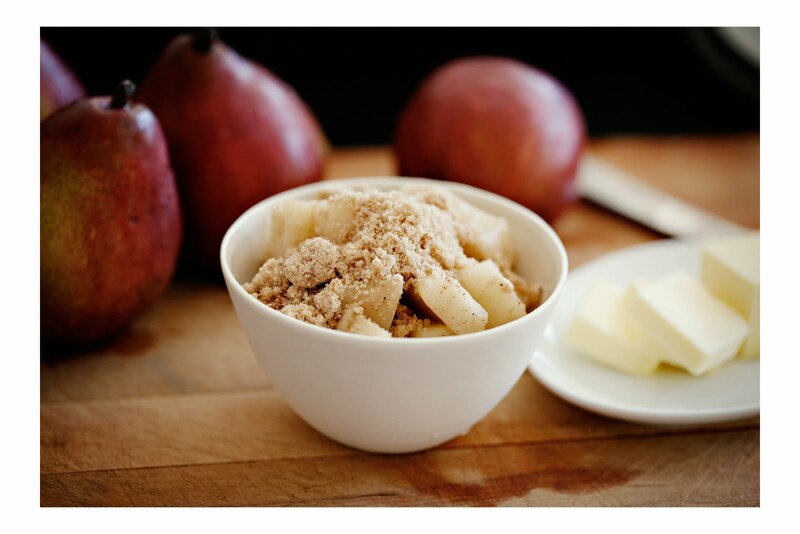 Toss the pear cubes in lemon juice, flour, brown sugar, cinnamon and nutmeg. Set aside. In a food processor, combine flour, butter, brown sugar, cardamom, salt and cinnamon. Pulse until mixture comes together and holds when pinched between your fingers. Put pears in a medium size baking dish. Crumble topping mixture over pears. Bake for 35-40 minutes or until crisp is brown and bubbling. Let cool for 20 minutes, and serve with a dollop of crème fraiche.